DEEP RUN — Washington may have ruined the night, but not the careers of South Lenoir’s seniors Tuesday. In the final home game of the season in baseball, softball and girls’ soccer, the Pam Pack won all three to put a bit of a hindrance on festivities. In baseball, Washington (12-4, 8-2 Eastern Carolina Conference) won 11-0 to maintain a half-game lead over Ayden-Grifton in the conference standings as Jensen Barwick, Heath Davis, Gavin Harrell, Everett Oliver, Landon Stroud, Smith Stroud, Luke Thigpen, Christopher Tyndall and Jake Wetherington weren’t able to finish their last games in Deep Run on top. Still, the South Lenoir seniors have won 41 games over the past four years with two more to play and had a third-round appearance in the NCHSAA 2A state playoffs in 2016. In softball, the Blue Devils’ furious rally fell short in a 5-4 loss that clinched the ECC for the Pam Pack (14-0, 10-0). South Lenoir (8-6, 7-3) trailed 5-0 going into the bottom of the sixth, but a 2-run single by Logan Lucas and a pair of errors after Macy Sanderson’s single plated two more, including Sanderson. Allie Parker was able to beat out a grounder for an infield hit with two outs in the bottom of the seventh, but it wasn’t enough. Despite the setback Tuesday, Parker, Kenly Hardison and Samantha Sutton have plenty to celebrate career-wise. The trio has gone 62-25 so far, including two ECC championships and a third-round appearance in the state playoffs last season. Parker said she’s learned quite a bit from her time at South Lenoir, and not just the fundamentals. Hardison said nothing is promised at South Lenoir. Sutton said perseverance is key. In soccer, South Lenoir kept it close early before Washington took over in a 10-1 game to clinch a share of the conference title. 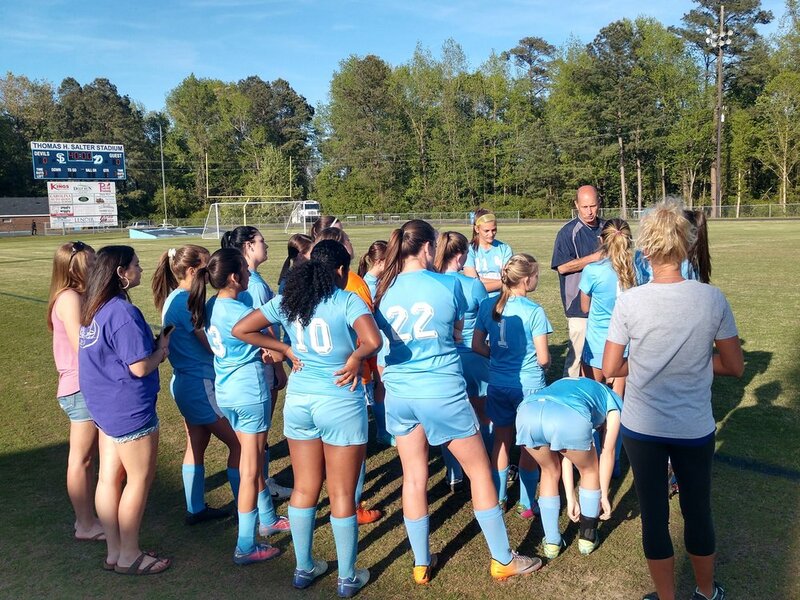 The Pam Pack (10-3, 6-0) can win it outright with a win over North Lenoir April 29, and opened up the scoring on a Rebecca Zerniak goal in the 15th minute before Candace Pierce responded six minutes later on a free kick from about 25 yards away, bouncing off of the goalkeeper and rolling in. From there, Washington’s aggressive offense took over. The Pam Pack were led by Zerniak’s five goals and Lilly Frances Lobos’ three, ending the game in the 69th minute. Despite the setback, South Lenoir coach David Whaley said he has nothing but positives about his six seniors — Catherine Edwards, Sydney Edwards, Keelin Howard, Hailey Lewis, JaQuoia McClain and Pierce. The Blue Devils (8-3, 4-2) are still on pace for a second great campaign after winning a school-record 10 games in 2018.